“The Korean People Want Peace”: Christine Ahn on Trump Walking Away from N. Korea Nuclear Talks | Democracy Now! founder and executive director of Women Cross DMZ, a global movement of women mobilizing to end the Korean War. "Women Marched for Korean Reconciliation. Washington Is in Our Way." A historic summit to denuclearize the Korean Peninsula ended without an agreement Thursday, after talks between President Trump and North Korean leader Kim Jong-un fell apart. Their second summit meeting in Hanoi, Vietnam, failed after Kim Jong-un demanded that the U.S. lift all sanctions on North Korea in exchange for dismantling the Yongbyon enrichment facility—an important North Korean nuclear site. We speak with Christine Ahn, founder and executive director of Women Cross DMZ, a global movement of women mobilizing to end the Korean War. AMY GOODMAN: We begin today’s show in Hanoi, Vietnam, where talks between President Trump and North Korean leader Kim Jong-un came to an abrupt end Thursday, after the leaders failed to reach a denuclearization agreement. Their second summit meeting fell apart over Kim Jong-un’s demand the U.S. lift all sanctions on North Korea. This is President Trump speaking at a news conference with Secretary of State Mike Pompeo. PRESIDENT DONALD TRUMP: I could have done a deal today, but it would have been a deal that wouldn’t have been a deal that—it would have been something that I wouldn’t have been happy about, Mike would not have been happy about. We had some pretty big options, but we just felt it wasn’t appropriate. And we really want to do it right. 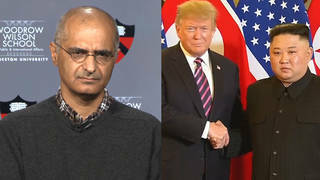 AMY GOODMAN: Trump said Kim had demanded sanctions be lifted in exchange for dismantling the Yongbyon enrichment facility, an important North Korean nuclear site. During the news press conference, Trump was questioned by David Sanger of The New York Times. DAVID SANGER: So, can you just give us a little more detail? Did you get into the question of actually dismantling the Yongbyon complex? PRESIDENT DONALD TRUMP: I did. Yes, absolutely. DAVID SANGER: —to take all of that out? PRESIDENT DONALD TRUMP: Sure, totally. PRESIDENT DONALD TRUMP: He would do that, but he wants the sanctions for that. And as you know, there’s plenty left after that. And I just felt it wasn’t good. Mike and I spent a long time negotiating and talking about it to ourselves. And just I felt that that particular—as you know, that facility, while very big, it wasn’t enough to do what we were doing. PRESIDENT DONALD TRUMP: —because there are other things that you haven’t talked about, that you haven’t written about, that we found and we have to have, that was done a long time ago but the people didn’t know about. PRESIDENT DONALD TRUMP: And we brought—yeah. DAVID SANGER: Including the second uranium enrichment plant. PRESIDENT DONALD TRUMP: David, I want to take off the sanctions so badly, because I want that country to grow. That country has got such potential. But they have to give up more. We could have done that deal. AMY GOODMAN: The working lunch was canceled between the two leaders. The summit’s collapse comes just days after House Democrats introduced a resolution to end the Korean War, after nearly 70 years of conflict. Democratic Congressmember Ro Khanna, who introduced the resolution, said in a statement, “Historic engagement between South and North Korea has created a once-in-a-generation opportunity to formally end this war. … President Trump must not squander this rare chance for peace,” he said. Well, for more, we turn to Christine Ahn, founder and executive director of Women Cross DMZ, a global movement of women mobilizing to end the Korean War. She’s in Hanoi, Vietnam, for the summit. Welcome to Democracy Now!, Christine. Can you respond to the collapse of the summit? CHRISTINE AHN: Hi, Amy. Well, it’s obviously a very sad day for 80 million Korean people around the world, especially on the peninsula, as we’ve been long waiting—67 years—for the U.S. and North Korea to declare an end to the Korean War. And many people, many pundits, many—I think President Moon—were expecting a breakthrough today, you know, including things such as the establishment of opening liaison offices in Washington and in Pyongyang. So, the sudden decision to cut short the meeting, to basically shut down the talks, and—it came as a sudden surprise. And the mood, which started out celebratory, was soon overshadowed by the sudden decision and the announcement that Trump made, that North Korea was demanding the full lifting of sanctions. And so, I mean, I want to first start by saying we don’t know what the full picture is. And, in fact, there have been now some reports coming out, especially from South Korea, the former minister of unification is suggesting that Bolton—of course—I mean, once we saw the picture of the table and we saw Pompeo and we saw Bolton, I mean, we had to—that was a red flag that something was going to be derailed. And so, what we understand from the South Korean side is that Bolton was insisting that biological and chemical weapons were to be part of the package. And so North Korea obviously shifted their position and called for full lifting of sanctions. So, we don’t know what the full picture is. We obviously have to hear from the North Korean side. But I wouldn’t just quickly, you know, take Trump’s line that North Korea was asking for something that is—was unreasonable, because, clearly, a lot of work had been done. I think Stephen Biegun, who is the special representative and envoy, clearly spent a lot of time. He gave a speech at Stanford a few weeks ago. It was perhaps one of the most thoughtful, comprehensive understanding of the situation, and it seemed as if we were on the brink of a diplomatic breakthrough. AMY GOODMAN: Let’s go back to President Trump speaking earlier today. PRESIDENT DONALD TRUMP: The inspections on North Korea will take place and will, if we do something with them—we have a schedule set up that is very good. We know things that—as David was asking about, certain places and certain sites. There are sites that people don’t know about, that we know about. We would be able to do inspections, we think, very, very successfully. AMY GOODMAN: Interesting, Christine. President Trump was not extremely critical of the North Korean leader. He was not being defiant. He got some help from Sean Hannity, who was in the audience, almost reminding him, saying something along the lines of, “President Trump, you know, of course, President Reagan walked away at Reykjavík, and that was just a strategy,” he said. But your thoughts on where you think this will head, President Trump saying maybe they’ll meet again soon, or maybe it will be a very long time from now? CHRISTINE AHN: Well, I mean, there are two things that give me hope in this current moment. One is, I mean, actually, the rapport, if you actually see the rapport that Trump and Kim have established. I mean, you need the leaders of the two countries to have good rapport. And clearly there is something there. And, you know, the fact that Trump said two things in his press conference really surprised me. One was, he put a dollar bill, the amount, a price tag, on the U.S. war drills. He said they cost $100 million. It’s a huge waste of money. The other thing he said was that the sanctions harm the people of North Korea and that he wouldn’t be adding more new sanctions. I think that’s a great outcome. It’s a great foundation. But we need to continue to build on it. We need to push for it. The other thing that obviously gives me hope is that the peace—the historic peace that’s taking place between North and South Korea. The Korean people want an end to this Korean War. Nine out of 10 South Koreans want a declaration to the end of the war. They have made tremendous progress. So, one of the key outcomes that we were hoping for was the lifting of sanctions, that are definitely getting in the way of inter-Korean economic progress. And so, I think that we have to take it to the International Court. We have to take it to the world of public opinion. Sanctions is not some kind of sterile thing. This is something that is having a daily impact on the lives of North Korean people. Sixty thousand North Korean children can starve as a result of sanctions. We’ve heard the special rapporteur on human rights say that the sanctions are impacting the day-to-day life of North Korean people. You know, this is not just a game of politics. This is a game of people’s lives. This is not a game. And I think that there’s an urgency, not just for the people that are living in North Korea, but think about the people of the Korean Peninsula, where they have lived for 70 years of a constant threat of war breaking out, intentionally or accidentally. This is not a game. And this is a moment where the international community must put pressure, whether at the U.N. level, and put pressure on the countries that have been siding with the United States, and say, “This is enough. This is enough.” Korea wants peace. And the international community has a responsibility to support it. AMY GOODMAN: Christine Ahn, can you talk about the role of South Korea’s president, Moon Jae-in, in facilitating the North Korea-U.S. negotiations? CHRISTINE AHN: I mean, he’s been absolutely essential. And the good news is that Trump asked his support after he left today, that he really wanted his support in, you know, continuing to play this facilitating role. But, you know, we would not be in this place were it not the incredibly effective diplomacy by President Moon. And, you know, we have to take a hard look at what is a true alliance. And is it alliance of the military? Is it alliance of the corporations? Or is it alliance of the people? And if the people of South Korea are asking the American people to support this historic peace, that won’t happen for another lifetime—and the stars are aligned right now. And so, I speak with—you know, having worked on this issue for most of my adult life. We are not going to have this opportunity. And so that’s why another thing that gives me hope is that Congressman Ro Khanna, Andy Kim, the first Korean-American Democrat, and several women congresswomen, including Barbara Lee, including Alexandria Ocasio-Cortez, Jan Schakowsky—they have all stepped forward to introduce this congressional resolution calling for an end to the Korean War and urging the president to establish a process towards the signing of a peace agreement. We’re not going to get to denuclearization, we’re not going to get to the improvement of human rights, until we get to peace. And, you know, declaring an end to the Korean War was going to be a first step, but it’s not enough. It’s not a legally a binding agreement. And we need to push for this. And as I wrote in an op-ed with Gloria Steinem in The Washington Post, the Korean War is America’s oldest war. It inaugurated the military-industrial complex. It set forth the U.S. foreign policy to be the world’s military police. I don’t think Americans want that anymore. And we have this historic opportunity to end America’s oldest war. We have a U.S. Congress that is the most representative ever of the American population, and we have the greatest number of women in Congress right now. This is the moment now to push for this war. It’s not just a symbolic thing. But think about—I live in Hawaii, where there’s the U.S. Pacific Command. Think about how much is invested in preparation for war with North Korea. Clearly, there’s China behind that. But think about what we can do. We’ll never be able to achieve the bold vision for Medicare for all or free college tuition or New Green Deal, unless we tackle the $700 billion budget that is currently being invested. And North Korea is the greatest—allegedly the greatest U.S. foreign policy challenge. We have a golden opportunity. The Korean people want peace. It’s time for the American people to stand up with them and urge the president. And if not, and if President Trump is not movable, then we have to try the U.S. government, and that’s where Congress has a role to play, not just to authorize war, but they have a role to declare peace. AMY GOODMAN: Christine Ahn, you were among hundreds of women who wrote a letter jointly to Donald Trump and to Kim Jong-un, calling for peace and saying peace women should be at the table. Can you explain? CHRISTINE AHN: Absolutely. I mean, I think right now the fragility of the talks shows that we have to democratize this process. We can’t leave it just in the hands of Donald Trump and Kim Jong-un. It needs to have—it’s not just a war, a 70-year war, between the leaders of the two countries. We have had generations of propaganda. We’ve always seen North Korea through a prism of war. And we need to have people-to-people engagement. That is what’s going to bring genuine peace. And we know that when women are included in the peace process, it leads to a peace agreement—and not just a peace agreement, but a really durable one. And when half the world’s population isn’t part of shaping a peace agreement that reflects the desire of half the world’s population, it’s not going to, obviously, be a just and sustainable one. So we’re demanding that there is a process that includes civil society and that includes women’s rights groups, because we have seen the record. In 40 conflicts around the world, in all but one case, when women’s groups were involved in the peace process, it led to a peace agreement. And we want to see denuclearization. We want to see peace. We want to see the improvement of human rights. We’ll never get there, until there is a true peace, until war is taken off the table. AMY GOODMAN: Christine, finally, I want to ask about Otto Warmbier, the American student who was imprisoned for more than 17 months for trying to steal a propaganda sign in a North Korean hotel, died in June 2017, a week after he was released from a North Korean prison and returned to the U.S. in a coma. When Trump was asked if he discussed Warmbier with Kim Jong-un at the Hanoi news conference, Trump said, quote, “He tells me he didn’t know about it, and I will take him at his word. Those prisons are rough. They’re rough places, and bad things happen. But I don’t believe he knew about it,” he said. Your response? CHRISTINE AHN: Well, I believe that it’s very possible that Kim Jong-un wouldn’t know and that perhaps those that were overseeing Otto Warmbier’s condition didn’t know what to do, when—you know, if—what they’re saying is that he fell into a coma and that they didn’t have the proper medical ability to treat him. But what we do know is that when he returned, when his body was returned back to the United States, the doctor that received him conducted—like basically did a full examination. And she basically held a press conference, after the Warmbiers did, and said, “I examined his body, and this is not the sign of—there wasn’t torture. In fact, you know, for his condition, he was actually—he was very well taken care of.” And that, unfortunately—there was a really great piece—I think it was in GQ, because the author couldn’t find another publication, but people should read that. It’s an incredibly insightful view into the complexity of what took place. But I think that’s a really important point that is obscured in the media and definitely hidden, is that the doctor that received him said—had a completely different narrative about the condition when he returned to the United States. AMY GOODMAN: There was the question of why he was held at all, for that length of time. CHRISTINE AHN: Oh, absolutely. I mean, you know, it’s an absurd thing. North Korea should have released him. There was no reason to do that. But I think, you know, it’s back to the issue of North Korea, and the situation on the Korean Peninsula is one of a state of war. And North Korea is a garrison state. It is in a siege mentality. And if we want to see progress towards that, isolating them, doing aggressive military exercises, you know, conducting sanctions that prevent the development of the economy—I mean, we look at the U.N. Security Council sanctions, for example. You know, it bans exports of textiles. I mean, who do you think works of these textile factories, but women? And so, we know that when women have access to the resources, when they control the purse, that the conditions of their families and their communities improve. So, how are we not seeing this broader geopolitical context of the conditions in North Korea? We have to say we have some culpability in this. AMY GOODMAN: Christine Ahn, I want to thank you very much for being with us, founder and executive director of Women Cross DMZ, a global movement of women mobilizing to end the Korean War, speaking to us from Hanoi, Vietnam, where the U.S.-North Korea summit has broken down. President Trump has left. But we will continue, of course, to cover this story. And we’ll link to the joint letter to both leaders from hundreds of women around the world calling for an end to the Korean War. This is Democracy Now! When we come back, highlights from the testimony on Capitol Hill yesterday of Michael Cohen. Stay with us.